Imagine showing up to work on what you think is going to be a regular day, but it turns out to be on of the best days of your life! 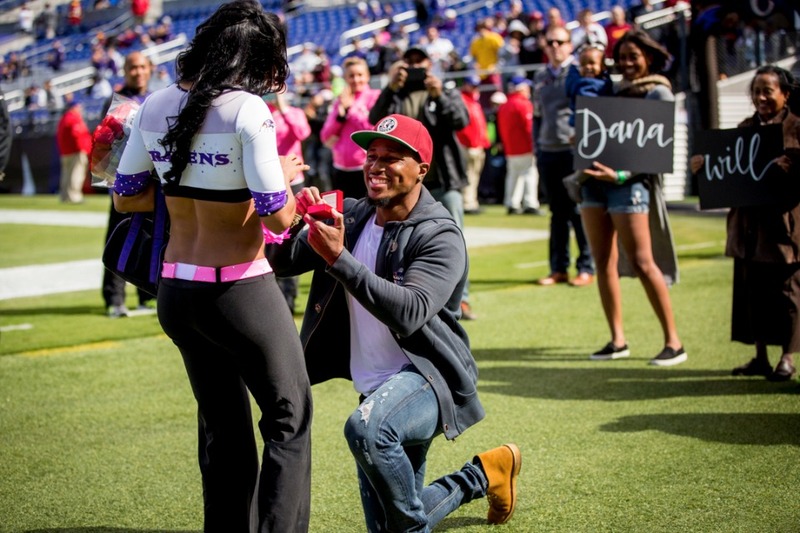 We love the thought of this and we're pretty sure that Baltimore Ravens Cheerleader Dana did too! It started as a normal Gameday morning. I woke up at 530am to get ready and leave my boyfriend Barron’s house for the stadium. That morning when I left I noticed Barron also got up, made the bed, and started moving around as if he wasn’t going back to sleep. Since the Ravens were playing the Redskins and a lot of our friends were watching the game that day, I didn’t think much of it. At the stadium, our pregame practice and prep in the locker room was completely normal. No one said anything out of the ordinary to me. No one mentioned that I should really like my hair and makeup that day. No one checked to see if my nails were done. Nothing. Before each game, we do pregame appearances and split up our team into two groups. One group visits the tents around the stadium and the other group goes down on the field and greets the fans. This particular game my director specifically mentioned that she wanted myself and 3 other vets on the field for our pregame appearance to make sure every fan was greeted and got a signed picture. So during the appearance I was doing my due diligence to make sure everyone in the stands was welcomed and got an autograph. While signing, I noticed our photographer focusing the camera directly in my face which is odd since she prefers natural shots of us. I ignored this slight shift in routine and kept signing autographs until my teammates called my name and directed my attention towards the tunnel. 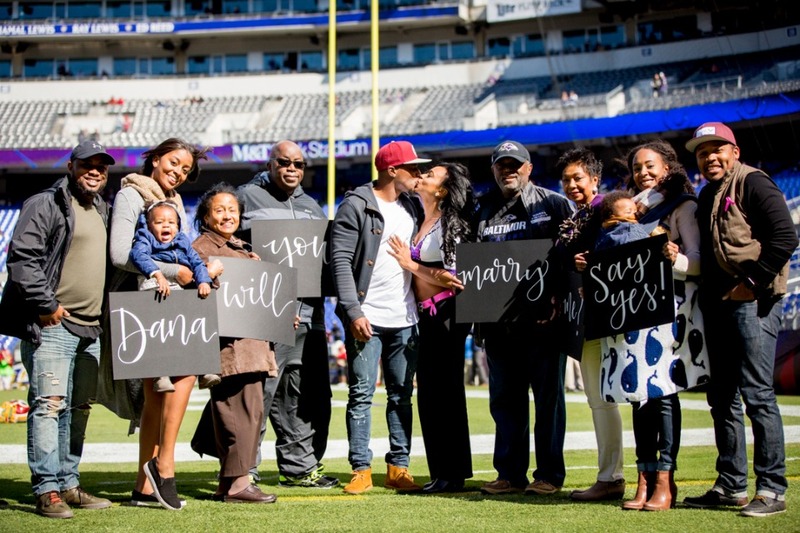 When I turned around I saw my family, my childhood best friend, Barron’s family, and his best friend on the field holding signs that read, “Dana will you marry me? Say yes!” in front of the tunnel. I probably stood still for a full 30 seconds in complete shock. My feet just wouldn’t move. Finally, I came back to reality and began walking towards him. He talked to me for a few seconds, said a few sweet words, then got down on one knee and proposed! After celebrating with my family and taking pictures on the field, I left to return to the locker room where my teammates shrieked as I walked in. It was so special to be able to share this moment with so many important people in my life! After the game, Barron told me we needed to get to the house quickly because we had dinner reservations for 7pm in DC. When we arrived I noticed my brother-in-laws truck was still in the driveway, but again didn’t think much of it because I knew they all came to the game together. Barron opened the house door and inside were ALL of my friends, Barron’s friends, our families and my teammates. They’d all come to the house for a surprise engagement party. I don’t think I’ve ever been so overwhelmed in my life. To think that so many people went to such great lengths to surprise me truly warms my heart. It was a day I’ll never forget and I’m incredibly grateful for my thoughtful fiancé. You can watch the whole proposal here. We actually originally saw it on Facebook and were so excited when Dana reached out to us to share her images and story! 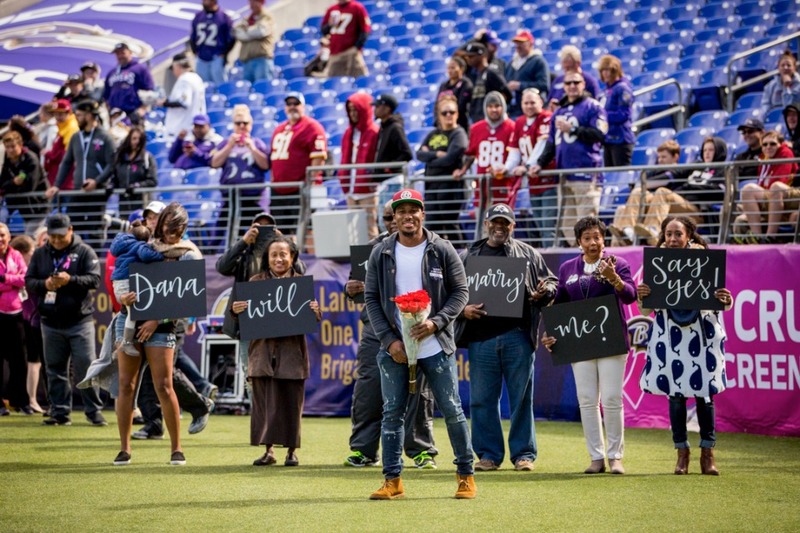 Be sure to see all of the real proposals that our readers have sent in here!